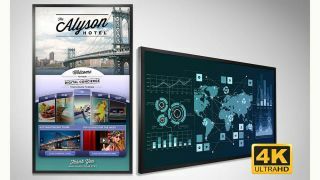 The What: Planar and Leyard have unveiled the Planar QE Series of Ultra HD LCD displays, the industry’s first all-in-one 4K solution for digital signage, according to the company. The What Else: Available in 75-, 86-, and 98-inch sizes, the Planar QE Series incorporates an embedded media player and software, providing a simple and cost-effective way to design, distribute, and play back ultra-high resolution digital signage on a single display or multiple displays within a network. Multi-touch models are also available, offering an affordable solution for professionals who seek to collaborate or interact using large-format, high-resolution displays. Audio is built into each display with two internal 10-watt speakers. The displays are compatible with a multitude of Ultra HD inputs, including emerging 4K sources requiring compliance with the High-bandwidth Digital Content Protection (HDCP) standard. According to the company, the Planar QE Series is the industry’s first end-to-end 4K digital signage system with a built-in media player and software. The displays come with an embedded Planar ContentSmart 4K Media Player, allowing users to more easily deploy and manage digital signage displays to deliver the right message to the right audience at the right time. The Bottom Line: All Planar QE Series displays offer 4K video performance, with support for native 4K at up to 60Hz, with HDMI 2.0 and DisplayPort 1.2 to enable smooth motion. The displays allow for four sources to be simultaneously viewed in quadrants on the display, making them well suited for collaboration or huddle environments in conference rooms as well as digital signage applications. The displays can be oriented in either landscape or portrait and come with a logo-free, all-metal bezel design for enhanced durability. The Planar QE Series will begin shipping in the first quarter of 2017 through Planar and Leyard’s worldwide network of authorized resellers.